British endurance runner Lizzy Hawker achieved her fourth win at the 9th edition of The North Face Ultra-Trail du Mont Blanc, August 22-28th 2011, in Chamonix, France. Whilst storms delayed the start of The North Face UTMB race by five hours, potential rock fall led to a diversion, increasing the course to 169km and creating the toughest race since the 1st edition in 2003. Despite the variable conditions including rain, snow, and extreme high and low temperatures, it was the fastest course to date. From a field of 86 women, The North Face runner Elizabeth ‘Lizzy’ Hawker (GBR) victoriously claimed first place to win The North Face® UTMB in a time of 25h:02m:00s, finishing 13th overall. The second fastest women result on record, incredibly Hawker becomes the first athlete ever to win the coveted title for the fourth time – 2005, 2008, 2010 and 2011. “With a race like The North Face® Ultra-Trail du Mont-Blanc you have to run with courage and humility – it was something very special to share the trail with so many people with passion for mountains and trails. I had a lot of pain in my hip and it took a lot for me to finish. I wasn’t sure if I would get to the end, but the shouts of ‘courage’ from the supporters helped me through,” explained a contented Hawker. Nere Martinez Urruzola (ESP) placed second, nearly three hours later with a time of 27h:55m:34s, with Darcy Piceu Africa (USA) placing third at 28h:30m:28s. From the starter field of 2,370 The North Face UTMB competitors, 1,700 runners shared their race in real time on personal Facebook and Twitter pages with family, friends and fans through the innovative LiveTrail APP. From start to finish line, live updates were posted from the course as checkpoints were passed enabling followers globally to track their runner. Approximately 4,800 automatic tweets and 24,000 automatic Facebook posts were recorded by LiveTrail on runners’ profiles and walls. The men’s The North Face UTMB race was intense from start to finish. It was double-podium for Spain as 24-year-old Catalonian Kilian Jornet Burgada (ESP) took 1st place honours to win the title finishing fast in a time of 20h:36m:43s and followed closely by team mate, 37-year-old Iker Karrera Aranburu (ESP) who completed just nine minutes later with a time of 20h:45m:34s. Amongst the leading pack, Miguel Heras Hernadez (ESP) had to leave the race after 20.5 hours of running, due to a knee injury. Each runner, tracked by a chip, provides data such as location, ranking and timing each time they go through a checkpoint. LiveTrail APP, a widget that connects the live tracking with the runner’s social media profiles, automatically posts their location details on their Facebook© and Twitter© pages. directly from their personal runner’s page on the race website or on eu.thenorthface.com. The North Face® is the leading community outdoor brand with nearly 1.3 million Facebook© fans. 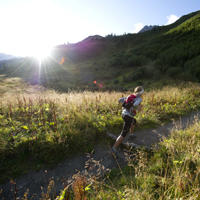 The North Face Ultra-Trail Du Mont-Blanc takes place annually during late August in Chamonix, France. 5,500 competitors from 58 different nations take part in one of four races: headline course The North Face UTMB 166km max. 46 hrs; CCC 98km max. 26 hrs; TDS 110km max. 31hrs; PTL 300km: non-stop. The North Face® UTMB®, of which 2,300 compete, crosses nine high elevation mountain passes, with a total positive height gain of 9,500 metres, circling the Mont Blanc massif through three countries: France, Italy and Switzerland.